In the South, you don't have to drive far to see an armadillo belly up on the side of the road. In fact, you might find them as far north as Missouri, as their range is expanding. These prehistoric-looking creatures are about the size of opossums, and the most common species has 9 movable rings that look like armor on its back. Armadillos are nocturnal. They burrow to create homes and in search of food such as insects, and occasionally, vegetable roots. Their burrows are often found near wood piles, stumps, and rock piles. 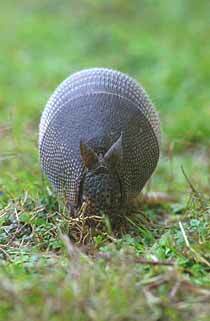 Since armadillos eat many insects, they can be beneficial to home gardeners. But armadillos may become a nuisance if they dig up lawns, bulb plantings, or vegetable and flower gardens while looking for food. Trapping is the best way to remove a problem armadillo. Because armadillos are nearly blind, place a live trap near its burrow and place boards as ″wings″ to guide the animal into the trap.